What has traditionally been the role of a woman? What will the role of a woman be in the future? 1. You will find the play The Trojan Women by Euripides on the MIT website listed above. Should at least 8 (2 men and 6 women) of you choose this project you must memorize and dramatize your parts. In the paper that you write, please identify and explain the background of these women. Where were the men who would have been their protectors? What was Cassandra's particular tragedy? What was the Trojan War? How did it become so well memorialized and why was the story of this war a part of the education of students for 2000 years? When the play was originally performed would women have played the parts? In what language did children of all languages read this epic from which this dramatization is based? Trojan Women is as Paul Harvey would say, "The Other Side of the Story." Should any of you decide to take on this project we will schedule a special time for your presentation. These women were highly regarded because of the quality of product they turned out...their children. How did they "produce princes" and what does Tacitus mean by this? 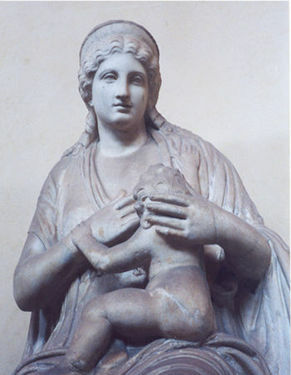 You may also include Clodia from the time of Caesar; Livia, wife of Augustus, and her granddaughter Agrippina the elder from the time of Tiberius in the 1st century AD, Julia Domna from the 2nd century AD, Helena, mother of Constantine the Great, and Christine Pizan ( http://www.pinn.net/~sunshine/march99/pizan3.html). Explain the character of the women. Tell of the accomplishments of their children. How did the times affect their mothering and child rearing. How does this group view women? In their own words, women are "female human capital," and those who choose the role of homemaker are in a "self perpetuating cycle of underinvestment in female human capital...a serious 'market failure' in our economy." (David Hornbeck, Human Capital and America's Future, p. 361. )What is the difference in attitude here? Where is the emphasis in ancient Rome...the gross national product or the quality of the citizenry? What does the term "human capital" suggest about the value of an individual? In which society are women honored for their role in "ruling the world" by rocking the cradle? What honor comes to women for their contribution to GNP? Which set of societal values did ancient women instill in their children: excellence/individualism/competition or equity/group learning/cooperation? Has there been a society where our modern cultural experiment has been tried before? What were the results? What can today's woman learn from these ancient women in light of the current zeitgeist?